I love this Premium Amber Ale – it’s a sublime refreshing ale. Dark Amber in colour with a small head that eventually disapates. There are lovely hoppy and biscuity aromas – followed by a lovely deep malty flavour with marmalade fruitiness – finished with a warm and perfectly balanced bitterness. Pure UBU (pronounced ‘OO-BOO’) is named after our faithful canine friend ‘UBU’, a maverick, brim full of character and the unofficial protector of our secrets. God love him, the dog is mad, but an inspiration to all who enjoy doing what they do and who want to be loved for being what they are. 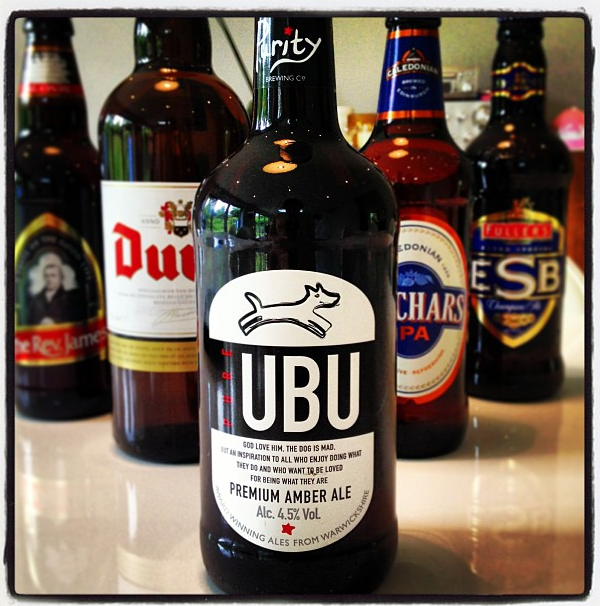 Pure UBU (4.5% ABV) is our strongest and darkest beer: a distinctive, full flavoured beer with a sweeter finish. Brewed with English Maris Otter, Crystal, Black and Wheat malts, with Hallertau Northern Brewer and Cascade hops. Winner of seven awards. Pure UBU is best served with red meats, game and strong cheeses.